Queens Real Estate Market Report December 2018, provided by the Queens Home Team at Keller Williams Realty Landmark II. Need help? Feel free to Contact Us anytime. Well, it’s December and along with Holiday Cheer and parties every weekend is the question of what the real estate market will look like next year. It’s hard to say for sure, but one thing we can safely predict is that interest rates will likely continue to rise next year. This year the increases were modest and spread out, however, every time the rate went up, we saw an immediate impact in buyer demand. 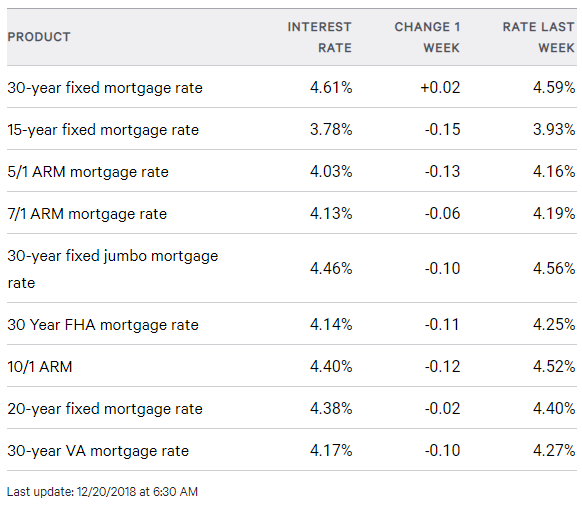 One important thing to keep in mind as we move into 2019 is the fact that as interest rates rise, prices typically suffer. The reason why is because historically, interest rates and home prices cannot both rise at the same time. Whenever interest rates go down, the net effect is usually rising home prices and vice versa. So, it will be important to see how many times the rate goes up next year and how significant the increases are. All in all, if we had to sum up 2018 in eight words it would be: More inventory, less demand, higher interest rates, and Amazon. The truth is that we started the year with 3,404 homes for sale in Queens and we are ending the year with a total of 4,481 homes for sale. Every month this year (with the exception of December) has seen an increase in number of homes for sale. This is the first time we’ve seen this kind of consistent supply increase in many years so it will be interesting to see if the trend continues in 2019. In addition, this is the first year that we saw year over year home price increases in the low single digits. For example, in January the median home price in Queens was 16% higher than the previous year, and in November, it was a up just 2.9%. The last three months have actually seen increases of 2.9%, 1.8%, and 5.7% respectively. This speaks to a trend that may possibly continue in 2019. As for demand, the fact of the matter is that this year has been slower than years past. You can ask any listing agent in Queens how their listings were this year and they will probably all tell you that it was a little harder to sell listings this year. In general, we saw more price changes and expired listings this year compared to the previous years. In addition, based on the 40+ listings we sold this year, we can personally say that there was definitely less interest & showings on most listings this year. The properties that still had strong activity seemed to be 1 family homes in the $400K – $600K range, multi family homes, and properties in Northwest Queens ever since the Amazon announcement.On that note, what’s up with Amazon? How will it affect the Queens real estate market? Is my home’s value going up? Are all Queens’ home values going up? Should I stay in my house and wait to sell? All very good questions, and while we aren’t by any means predictors of the future, we can at least make some educated guesses as to what the local impact will be. Here’s what we think in a nutshell. We believe that we won’t see any significant impact of the move until 2020 when Amazon is scheduled to arrive. A lot of people are making assumptions about how this will impact the market and some people have a misconception that the impact is immediate. While we do have an uptick in demand in Northwest Queens, for the most part buyer demand has not shifted dramatically since the announcement. If anything, it has created a little more urgency for buyers looking in Northwest Queens neighborhoods. For example, we are currently selling a two family home in Astoria, 2 blocks from the train, and last weekend was the first open house. While we did have over 30 groups come by (which is a great), only two buyers made offers and both were below asking price. We believe that over the next two years, inventory and interest rates will still be the biggest drivers in terms of impact on the local market and home values in general. Although Amazon’s move will undoubtedly have an impact on certain neighborhoods like Astoria, Sunnyside, Jackson Heights, etc. the truth is that for all other neighborhoods in Queens, the main driving force will still be interest rates, inventory, and affordability. Once Amazon comes, we anticipate that rental demand will increase first because there will be 25,000+ workers moving into the area and most of them will probably want to rent before they decide to buy. This will likely drive rent prices up during the first year or two, and as a result, home values in those areas will likely see a spike as well. We believe that the Queens neighborhoods which will benefit the most from Amazon’s move here are all of the neighborhoods that offer an easy commute to Long Island City. Most of the workers will be looking in Long Island City, but being that the prices there are extremely high, neighborhoods like Astoria, Sunnyside, Woodside, Jackson Heights, Elmhurst, and Corona will likely see a spike in demand as well. Other neighborhoods that can possibly see a spike in demand are historically popular areas for commuters like Forest Hills, Rego Park, and Bayside off the LIRR. The Long Island Board of Realtors reported a total of 642 homes during the month of November. This was a decrease of 18 percent from October and a decrease of 13.7 percent compared to November of last year. Specifically, our Queens real estate market report December 2018 shows that Residential home sales were DOWN 15%, Queens Condo sales were DOWN 8.1%, and Queens Coop sales were DOWN 12.6% when compared to the same month last year. Over the last 12 months, Queens home sales are DOWN 4.4%. 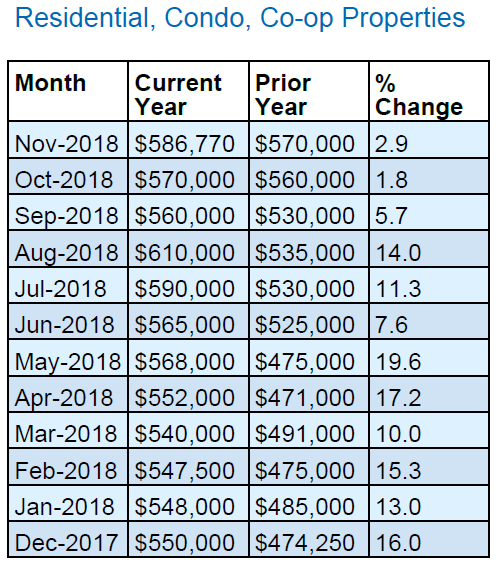 In November, the median home price in Queens was $586,770, this is an increase of 3 percent from last month, and an increase of 2.9 percent when compared to November of last year. The median home price has increased by approximately $16,770 since last year. Specifically, our Queens real estate market report December 2018 shows that the median home price for residential homes in Queens was UP 3.7%, median home price for Queens Condos was UP 2.7%, and the median home price for Queens Coops was UP 5.6% compared to November of last year. 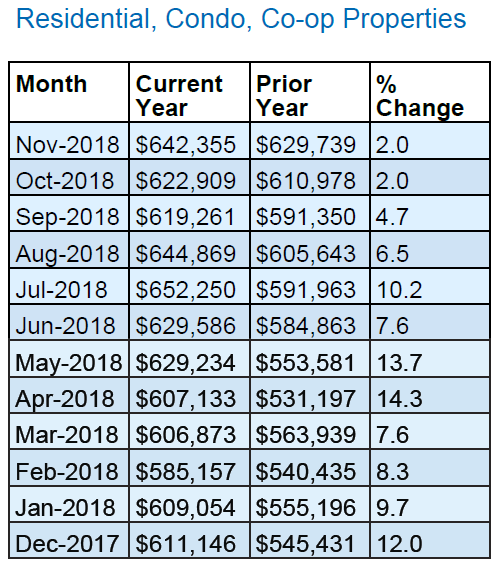 Over the last 12 months, the median home price in Queens is UP 9.8%. 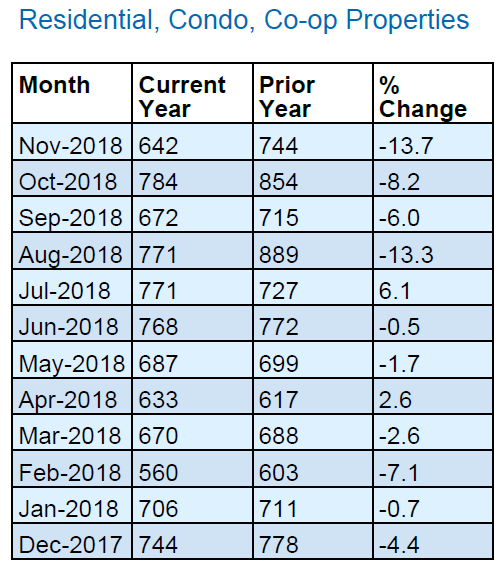 There is currently a 6.1-month supply of housing inventory in Queens, this is down slightly from the 6.3-month supply we had last month, and up from the 4.6 month’s supply we had in December of last year. There are currently 4,481 homes for sale in Queens. This is a decrease of 3.2 percent compared to last month, and an increase of 29% compared to December of last year when there were 3,484 homes for sale in Queens.